Born in Missouri, A. Quincy Jones was raised in Gardena, California and Seattle, Washington. He attended University of Washington’s architecture program, graduating in 1936. Jones returned to Los Angeles, working first in the offices of architects Douglas Honnold and George Vernon Russell from 1936 to 1937, and Burton A, Schutt, 1937 to 1939. From 1939 to 1940 he worked for Paul Revere Williams; next working in San Pedro at Allied Engineers, Inc., where he met Frederick Emmons. In later years, Jones worked in partnership with both Emmons and Williams. Jones received his architect certification in 1942. He received a commission as a lieutenant in the U. S. Navy, where he served in the Pacific theater. Discharged in 1945, Jones returned to Los Angeles and opened an architecture office in Laurel Canyon. The years after the war saw Jones partnering with Paul Revere Williams on several projects in the Palm Springs area. These include the Palm Springs Tennis Club (1947), the Town & Country restaurant (1948), and the restaurant Romanoff’s On the Rocks (1950). Jones also participated in the CaseStudy House Program. In 1950, Architectural Forum magazine featured one of Jones’ projects as “Builder’s House of the Year.” Soon after, Jones began a relationship with building magnate Joseph Eichler that lasted until Eichler’s death in 1974. 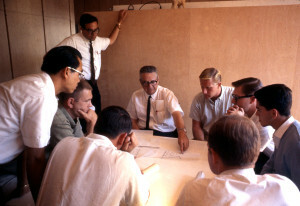 Jones partnered with Frederick Emmons, contributing designs for more than 5,000 of Eichler’s homes. Jones was also a professor and, later, Dean of Architecture at University of SouthernCalifornia’s School of Architecture, from 1951 to 1967. In the 1960s, Jones designed buildings on a number of campuses of the University of California, as well as the luxury estate of Walter Annenberg in Rancho Mirage, California. Throughout his career, Jones was interested in raising the trajectory of American architecture. Jones raised the tract house in California from the simple stucco box to a logically designed structure integrated into the landscape and surrounded by greenbelts. He introduced new materials as well as a new way of living within the built environment and popularized an informal, outdoor-oriented open plan. More than just abstractions of the suburban ranch house, most Jones and Emmons designs incorporated a usable atrium, high ceilings, postand-beam construction and walls of glass. For the postwar moderate-income family, his work bridged the gap between custom-built and developer-built homes.